Lu Eccles, a Bheny supporter was inspired by the Bheny logo to knit a doll like it. The result was adorable, even to tiny thumbs, and people were drawn to discuss it. A conversation starter to talk about hearing issues in Qikiqtani was born. Knitting kits with instructions and yarn were packaged and sold for $20 and knitters around the world have taken up the challenge. 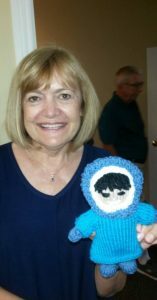 In South Africa, the 92 year old mother of another Bheny supporter, Terry Jarvis, knit 10 dolls for distribution in Iqaluit and Clyde River on the next Bheny launch. And these Bheny dolls travel! So far word is that Bheny dolls have visited Paris, France; Edinburgh and St. Andrews, Scotland; Fort Myers, Florida; and Melbourne, Australia. Wherever Bheny goes, awareness of the hearing issues endemic in the North and ways to help improve the situation are highlighted. If you would like to knit a Bheny doll, kits are still available. Here are some photos of Bheny dolls during journeys. Thank you everyone for raising awareness.